(thank you for the generous $20. At least have some lemonade!). The kids made lemonade, made signs and decorated the lemonade stand. We sent invitations asking people to stop by NAS and say hello, share a glass of lemonade with us and help change a life. The generosity of our community was in full force and the response was overwhelming. NAS would like to extend a heart-felt “thank you” to the kind people who participated in our efforts. Because of your kindness, you are helping us to change a child’s life by supporting research to find better treatments and cures for childhood cancer. 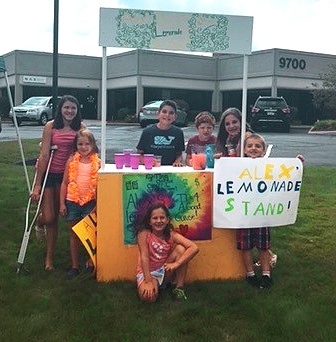 Our lemonade stand raised an astounding $390 in just a few hours. We’ll be adding that to the funds we are collecting online. There’s still time to make a donation. Our sponsor page will be active until August 31.